Tango Capital Management is a registered investment advisor and active investment manager with offices in Long Valley, NJ. adapting portfolios to market realities. Tango Capital Management is a fee-only, discretionary portfolio manager, in that clients assign Tango the ability to buy and sell positions in their accounts based on technical and fundamental analysis and risk assessment. Tango Capital Management blends fundamental and technical analysis to create client portfolios using individual equities, exchange traded funds (ETFs), index funds and leveraged funds. Our emphasis on individual securities is based on the reality that these securities often offer the greatest potential for appreciation. There may be times however, when a more diversified or sector-focused approach is desired, in which case ETFs or mutual funds are used. Investment selection targets what we believe are the best investments given current market conditions. Because Tango is an active manager, we do not use widespread diversification to reduce risk in the portfolio. Instead, portfolios are adjusted as needed to reflect current market opportunities and risk. As a registered investment advisor, we are a fiduciary, required by law to place the interests of our clients first. One way we strive to do so is through transparency. All accounts are separately managed accounts, held in the client's name at an independent custodian. Clients have online access to the account at all times and received regular statements directly from the custodian, as well as Tango's quarterly reports. Tango uses technical analysis to track more than 200 industry sectors to identify leading sectors that our indicators show have the greatest potential for outperformance. Top performing stocks within the leading sectors are targeted as potential investments. Fundamental analysis is used to narrow our targets within a leading sector to one to three individual stocks that meet our investment parameters. Those stocks are held as long as they continue to be bullish. Sometimes an individual company will continue to be held after a sector falls from leadership, as long as the stock continues to stay bullish. When a stock falls from the bullish category, it is sold and a new position established. Our approach is a risk-managed investment style. All investments and all investment strategies have the potential for loss as well as gain. 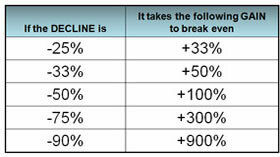 A buy-and-hold approach is 100% vulnerable to market downturns. That is not a risk level we find acceptable. Nor is it one investors need to accept. Technical analysis gives us the tools to recognize periods of increased risk in the financial markets. Depending upon these indicators, Tango may lower its equity exposure or hedge that exposure through inverse funds that mirror the market's movement, moving up when the market falls and down when the market or index the inverse fund tracks moves up. in addition to striving to minimize the potential for losses, risk management reduces the volatility of the portfolio making it one that it is easier for investors to stick with over the long term. While Tango Capital Management cannot guarantee that our investment approach will be successful, we have an established a solid track record for performance. At a time when "financial experts" are espousing passive index fund investing, we believe there is a need for sound reasoning and good judgment in the investment realm. It is the role of the fiduciary not only to invest his client's funds prudently, but also to have in place a strategy to protect those funds from market declines, to minimize losses when an investment falters and to strive to assure that the client's funds are available when he or she needs them. This is the heart of active management. The market cycle Financial markets are cyclical, moving from boom to bust; bull to bear. The U.S. stock market experiences a bear market - when the S&P 500 declines 20% or more - on average once every five years. The average bear market since 1931 has erased 30% of the market's value. Returning to breakeven has taken from seven months to 10 years. Losses hurt more than most investors realizeAny time investors can avoid or minimize a loss they gain leverage when markets recover and avoid losing gains making up lost ground. Trading efficiencies add up over timeUnderstanding the financial markets, knowing how to identify who is selling or buying, and recognizing spread divergence, makes a difference in efficiently executing trades, saving fractions of a percent that become real money over time. There is always something going upTango's analytical database tracks over 200 sectors on a daily basis. Even in down markets, there will be sectors showing growth. An active investment approach allows the portfolio manager to take advantage of these opportunities for gains.